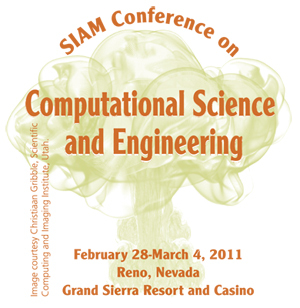 Sponsored by SIAM Activity Group on Computational Science and Engineering. To see more photos from CSE11, see our CSE11 Photoset. Most of the invited speaker presentations and a selection of minisymposia presentations from the 2011 Conference on Computational Science & Engineering have been captured and are available as slides with synchronized audio. In addition there are PDF’s of the slides available for printing. View presentation slides with synchronized audio. Contributed presentations in poster format are invited in all areas consistent with the conference themes. Presentations involve the use of non-electronic visual aids for mounting on a 4' x 8' poster board. In addition, this conference will feature a plenary “Poster-Blitz” session. Each poster presenter will be given a one-minute time slot to talk about and advertise the work preceding the poster session. For participating in the blitz session, each submission of a poster must include exactly two slides (no exceptions!) in PDF-format that will be displayed during the Poster-Blitz. Presenters of accepted posters will be contacted with instructions of where to submit slides. Additional submissions for poster presentations are being accepted through January 31, 2011. Accepted submissions will not appear in the final printed program but will appear online. Interested parties should submit using the online submission site. Note this submission site is for poster submissions only. Submissions of any other type will not be acknowledged. This deadline will not be extended. Note: Extended deadline is for poster submissions only. No additional minisymposium proposals or lecture submissions are being considered. Participants are encouraged to consider submitting posters as alternatives to contributed talks. CS&E-11 will feature a plenary “Poster-Blitz” session. Each poster presenter will be given a one-minute time slot to talk about and advertise the work preceding the poster session. For participating in the blitz session, each submission of a poster must include exactly two slides (no exceptions!) in PDF format that will be displayed during the Poster-Blitz. disciplinary areas such as physics, chemistry, biology, etc.